Watch with your #AOFamily at nearly 200 chapter locations! When you’re digging back from missing the World Cup, you have a new coach, and A LOT of questions… sometime you celebrate the little things in life… even if they’re ridiculous. A win. Is a win. Is a win. And the Gregg Berhalter-era is off. Our Ryan Rosenblatt took the Marie Kondo approach and took joy in last Sunday’s win in his wrap piece. “The USMNT won. The young team looked good. It was downright exciting to watch. Let’s show the gratitude that match deserves and put it away as we move on to this afternoon matinée against Costa Rica in San Jose (sidebar: how weird is the plane ticket that has San Jose, CR —> San Jose, CA???). Berhalter’s crew faces another CONCACAF foe to open 2019. Get used to this in 2019. We’ve got Gold Cup on the horizon this summer and Nations League in the fall all against our hemisphere. We saw an organized and relatively effective outing last time from our domestic-based youngsters and the hope is that we can put that on repeat today. A few more good looks at some players who could fill a few roster spots come summer when the defense of our Gold Cup title rolls around again would be nice as well. Costa Rica has emerged as one of CONCACAF’s strongest sides qualifying for four of the last five World Cup five times since 2002, including last year’s tournament (what World Cup?!?!?). The USMNT trails the all-time match up 15-16-6, but have 15-6-4 lead when playing in the U.S.
Let’s find that feeling again today. Let’s have some fun, preferably with your AO brethren at a chapter bar. PS: Looking for AO tickets for upcoming MNT and WNT games? 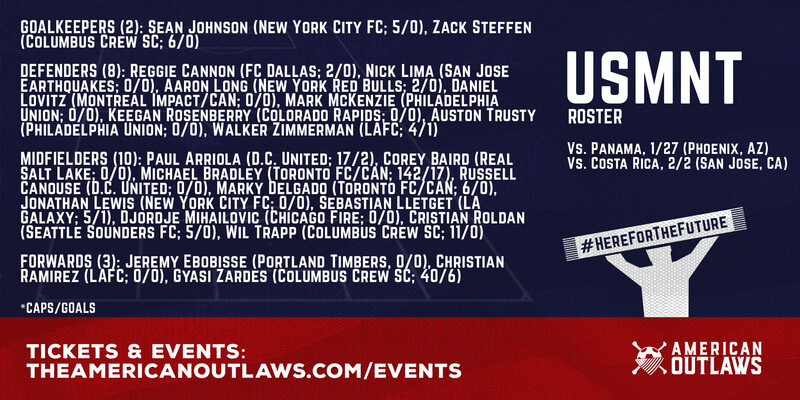 Check out the event page on the American Outlaws website for all the latest links.